Real time search has been causing real time spam as well. Let’s see what the big players in the search are doing to make real time search useful. Body – Danny Sullivan moderates the session and speakers on the panel are Sean Suchter, Ivan Davtchev, and Dylan Casey. First up is Sean Suchter from Bing Social Search who states some of the obvious challenges namely keeping up with speed, making sense of massive content and relevance of search. Most often the results from twitter are timely but not accurate and often opinionated, reactive and not to the context/relevance. Most of the incidents get real time response from platforms like twitter over traditional news sources. So to rise above the noise, there is a lot to do as search gets more social. Trust worthy people sharing your links and tweets. The search engines are determining how important you are. What is Real time search? It’s about showing the most relevant up to date content for a topic. Yahoo recently established partnership with twitter. Raking of fresh content: How to find proper anchor text. They figure it out based on emerging events and news stories (natural disasters, sports political news). He talks about Google trend being a good indicator of how a popular a query is. It works well for head queries but not as much for tail query. So standard approach is not ideal. Some of the algorithms metric are internal. 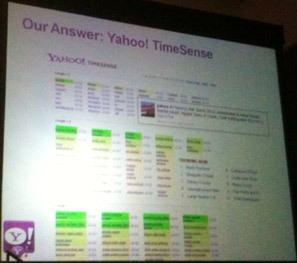 Yahoo Time Sense for example is an internal tool which plays a key role. How is this different & better? They have Language modeling- it means collection of all known words and query log. Why language modeling? It allows you to ask questions and tells whether the search is prominent and if the data of past search matches to it…then it marks it as relevant to real time search. Yahoo is removing real time spam. So watch out! What is real-time, why real time is important? All social media tools and channels have made everyone a publisher. As publishing barrier gets less competitive, the need for speed and relevancy goes up. People have begun to use content differently. Why the explosion of information and why now? Influencing factor of email Vs instant messaging, generating user experience through instant results have become the trend. 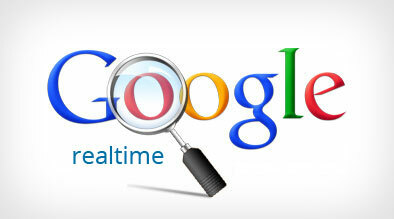 They introduced real time search in dec 2009. They will be adding new providers such as facebook, myspace and google buzz. In order leverage the technology they use for ranking documents Google has come up with something new. They look at the number of followers. They look at author quality. Conclusion: Some of the key take aways here are: Marketers need to be more prudent in what they want to market. Beware of spamming as most search engines are filtering them out. Lastly write often, find something you are passionate about, pay attention to the mechanics of SEO but don’t overdo it.